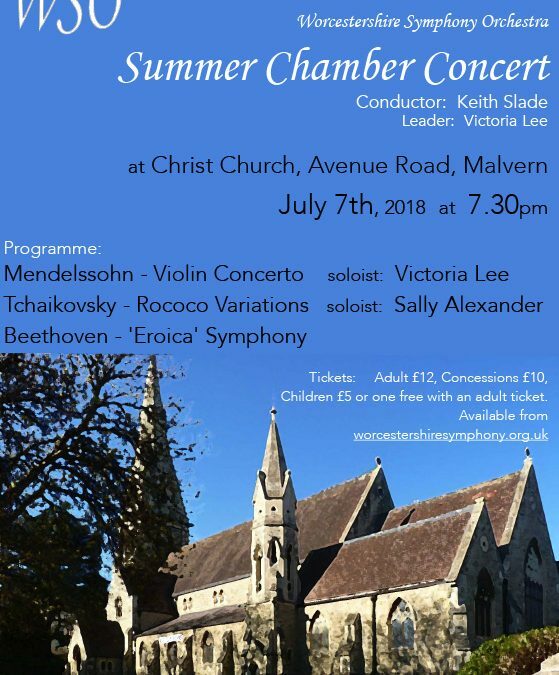 On Saturday 7th July 7.30 p.m. Worcestershire Symphony Orchestra perform a programme of Mendelssohn – Violin concerto, Tchaikovsky – Variations on a Rococo theme for cello, and Beethoven Eroica Symphony. The soloists will be leader, Victoria Lee and Sally Alexander, leader of our cello section. There will be wine and soft drinks at the interval. Adult £12, Concession £10, children £5 or one child free with each adult ticket. All can be purchased through worcestershiresymphony.org.uk and on the door.